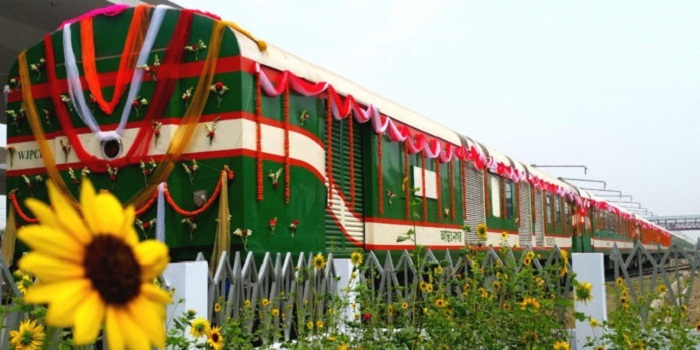 A non-stop intercity train named ‘Bonolota Express’ is likely to be running on Rajshahi-Dhaka route to meet up the long-cherished demands of people from 25 this month. The 932 seated ultramodern and high speed train with 12 coaches including two air-conditioned chairs and seven non-air conditioned chairs is likely to run on the route without any stoppage between Dhaka and Rajshahi from April 25 next. Shah Nawaj, Chief Commercial Manager of West Zone of Bangladesh Railway, told BSS that the train will be a new addition to the existing three intercity trains – Silk City Express, Padma Express and Dhumketu Express- on the route. The train will start from Rajshahi at 7am and reach Kamalapur Railway Station by 11am. It will leave at 1:30pm and reach Rajshahi at 5:30pm. He said 50 high speed and modern coaches were imported from Indonesia to new trains on different routes including the Rajshahi-Dhaka one. The forthcoming train will save at least two hours journey time than that of the existing three express trains, he said adding that the train will run on the 343-kilometer route every day excepting a weekly day-off. He said the west zone has been implementing four mega projects at a cost of around Tk 1,829.76 crore aiming at bringing dynamism in the railway transportation along with boosting quality of services. At present, the zone, covering Rajshahi, Rangpur and Khulna divisions, has been operating 133 trains, including 43 intercity, on different routes including the capital. Forty-seven local or shuttle and 46 commuter or mail trains are also being operated on various routes.